This is my review of the Metropolitan Live in HD production of the opera La fille du regiment (“Daughter of the Regiment”), that great comic opera by Gaetano Donizetti. I saw this production yesterday in an American movie theater. It was really good and lived up to expectations, although I do have some quibbles about the set design and the production itself, which I’ll get to later. Maestro Enrique Mazzola conducted the Met orchestra brilliantly, and with much verve. 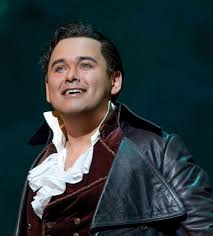 The high point, of course (pun intended) of the show, was Bel Canto tenor Javier Camarena’s rendition of the famous Act I cavatina “Mes amis” with its infamous nine High-C notes! Enough to shred the vocal chords of any ordinary man. Met publicists had been teasing the audience for weeks, whether Camarena might be induced to sing an encore of this aria. It has become traditional for audiences to demand this of him, but an encore of a particular piece had never been attempted before in the Live in HD production. So this would be a First. Well, of course we all knew that it would happen! And indeed, Camarena performed this song seamlessly, the audience went wild with stomping and cries of “bis”, upon which he did it again, also seamlessly! During the intermission, the Live in HD host, Nadine Sierra, asked Javier if it was difficult to nail, not 9, but 18 High C’s! Javier replied that, when he practices this piece, it is not uncommon for him to sing 40 or even 50 High C’s. The more practice, the better he gets at it! Ah ! mes amis, quel jour de fête ! Désormais me rend un héros. Trouble ma raison et mon cœur ! Le camarade est amoureux ! Et c’est en vous seuls que j’espère. Quoi ! c’est notre enfant que tu veux ! Non pas… elle est promise à notre régiment ! Je viens de m’engager, pour cela seulement ! Mais votre fille m’aime ! Se pourrait-il !… quoi ! notre enfant ! Elle m’aime, vous dis-je… ici, j’en fais serment ! Les soldats se consultent entre eux. Que dire et que faire ? And the virtuosity is even greater than people think, as the High-C’s on the words mon âme and sa flame are reached, not from a crescendo, but just go directly one octave up, from a Middle C. There are not many tenors in the world who can do this with such perfect pitch. Javier, with his sweet strong voice is the pride of his Mexican homeland. Not to be outdone, though, we have an equally strong female Bel Canto lead in South African soprano Pretty Yende. Recently Yende has been specializing in Donizetti roles; I saw her earlier this season as the lead in a production of L’elisir d’amore. Yende is such a professional, that she can even sing Lucia di Lammermoor, that crazy lady with the insane ornamental trills. 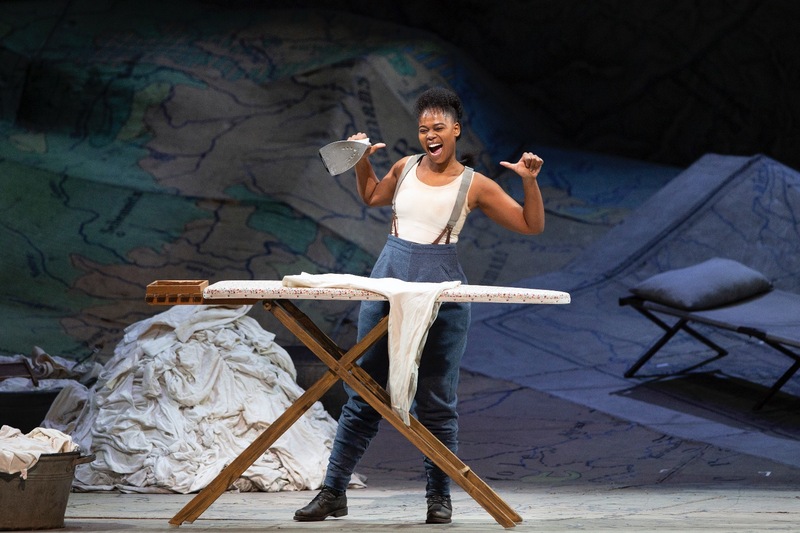 In other words, Yende has the perfect Bel Canto voice and can do any mad scene or pyrotechnic demanded of her. As Marie, the Daughter of the Regiment, she was even asked to belt out her ornaments while ironing a full load of laundry, a feat of virtuosity rarely demanded of any performer. In a backstage interview, Yende revealed that she is a member of the Zulu nation (South Africa), and even added some Zulu clicks to her improvised spoken dialogue, getting into the character of the orphan girl Marie. The audience didn’t mind and even found it adorable. Some purists may object, Well, what’s a young Zulu woman doing in the Tyrolean mountains of Austria, anyhow? Dudes, opera is all about suspending disbelief. If you can watch a 50-year-old chubby guy in a bearskin pretending to be an athletic 16-year-old Siegfried, then you can also close your eyes and pretend that a Zulu girl is a German orphan. The key point here is that Pretty Yende has the pipes to sing this role. Her arias brought down the house, as much as Javier’s, but no Encore for her … yet! Pretty’s rambunctious and tomboyish portrayal of Marie was sometimes over the top, for my taste, I would have preferred a sweeter and more demure girl; but then one also has to remember that she is performing on the stage and projecting to an audience of 5,000 people. The fact that we get a different view of her, in close-ups, is a function of the Live in HD technology! In fact, this technology turned the “comic opera” into slapstick and even vaudeville at times. Lots of hamming up, in other words, and done by all parties concerned! This entry was posted in Opera and tagged Gaetano Donizetti, Javier Camarena, La fille du régiment, Nadine Sierra, Pretty Yende. Bookmark the permalink.